Cosmetic Gum Treatment in Mission Viejo | Orange County Periodontists | Ajay B. Setya, DDS, MSD Robert C. Hirst, DDS, MS Christen S. Bergman, DDS., MS.
Gums that cover too much of your teeth or an uneven gum line can cause your smile to be unattractive and in some cases can affect your oral health. When the crowns of your teeth are covered by excess gum tissue, it can make your teeth look too small and you appear to have what is called a “gummy smile.” Uneven gum lines surrounding your teeth make the smile lack symmetry. Dr. Setya, Dr. Hirst, and Dr. Bergman are experts at lengthening the crowns of your teeth to fix a gummy smile and recontouring your gum line to give your smile a natural and aesthetic appearance. 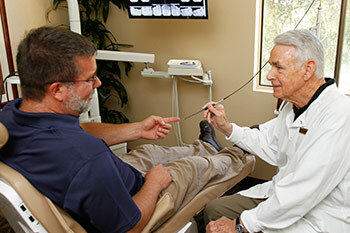 With our high-tech equipment we will have a less invasive approach to achieving your new smile. Dr. Setya, Dr. Hirst, and Dr. Bergman use a dental laser or microsurgery instruments for much of the cosmetic gum treatment. The laser gently cuts gum and other soft tissues and the incisions heal far faster than those made with standard surgical instruments. Micro-instruments are minimally invasive surgical devices that can zero in on very small areas, making the procedures affect far less tissue. When possible, the doctor will reposition the gum line around the tooth without having to cut it away. Using special instruments, he gently detaches the gums from the tooth and roots and repositions the gums around the tooth in a better position. This prevents possible gum recession from occurring as a result of cutting away tissue. Gummy smiles can be both a cosmetic concern and a potential health problem. A tooth with too much gum covering it cannot always be completely cleaned, and is harder to treat if it develops decay or fractures. To correct a “gummy smile,” the doctor gently removes the excess gum and bone tissue covering the teeth, and removes excess gum tissue distant from the gum line as necessary to bring the gum tissue down to the proper thickness. He then re-sculpts the gum line around each tooth to the right shape. The teeth will then be the right size in the mouth and the smile will look attractive and totally natural. The teeth will also be much easier to clean thoroughly once excessive gum tissue is removed. Your teeth can be white, healthy and straight, but an uneven gum line around your teeth can still reduce the beauty of your smile. The doctor can correct this by gently recontouring the gum line around your teeth. Your smile will then be enhanced as the gums will be symmetrical and will be their proper size and shape around the teeth.